Starbucks, in partnership with Yahoo!, recently announced the launch of the Starbucks Digital Network, which is available to customers using the free Wi-Fi in their US stores. The Starbucks Digital Network will appear as a landing page to those who click on the Wi-Fi, and it offers news, entertainment, and lifestyle content along with local insights and events. There are two content groups from the publishing world on the Entertainment channel, Bookish Reading Club and New Word City. Bookish Reading Club offers free access to books each week from numerous publishers including Hachette Book Group, HarperCollins, Penguin Group (USA), and Simon & Schuster, with offerings from more publishers in the near future. A new HTML5 reader, powered by SkyShelf(TM) from LibreDigital, allows customers to read books in the browser on their laptops, tablets, and many smartphones. Delivering a new series of short eBooks on business management, leadership, and travel to the Starbucks Digital Network, New Word City offers stories and ideas from authors including Captain Mike Abrashoff, Jim Champy, Juan Enriquez, Jeffrey Gitomer, Seth Godin, John Kao, Don Tapscott and Alan Webber. New Word City will offer a combination of excerpts and full books, including original travel guides with ranging appeal for everyone from the armchair traveler to the adventurer. The network will feature an exclusive excerpt from best-selling author Seth Godin’s new book Graceful, which shares how to navigate the changes in our world. During launch week, an extensive excerpt from Rescue, the new upcoming novel by best-selling and acclaimed author of 10 New York Times bestsellers, Anita Shreve will be available. Provided by Hachette Book Group, only Starbucks Digital Network customers get an exclusive sneak peek of Rescue before it hits shelves on Nov. 30. Customers who want to purchase any of the featured books will be directed to Apple’s iBooks store. This partnership with Starbucks should help the iBooks store, which has struggled to compete with Amazon’s ebook store. What do you think about this news? 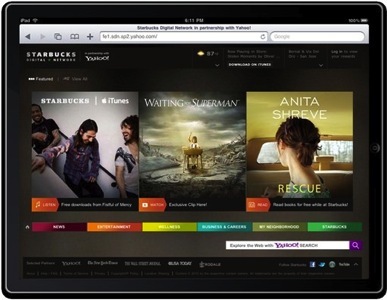 Will you check out the books on the Starbucks Digital Network?